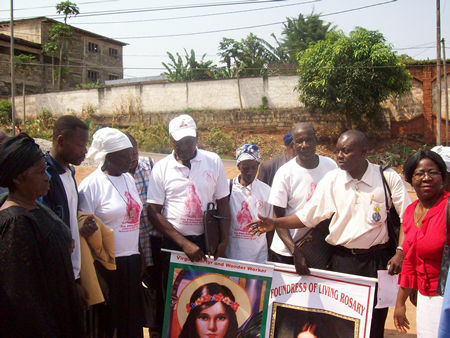 Yesterday, I met the Apostolic Administrator and thanked him on the behalf of the Universal Living Rosary Association of Saint Philomena (ULRA)....... for all the concern shown to me. He promised to push ahead with the activities when I might have gone back. I also, met Rev. Fr. Garry [British] at the Sacred Heart Cathedral after Legion of Mary meeting where he is a Spiritual Director. He was delighted for few Sacramental I gave him. Also, today I met Rev. Sr. Mary Laurene, to thank her for the entire plan she played for my coming. She told me that she is very pleased for my coming and all the activities of the ULRA... 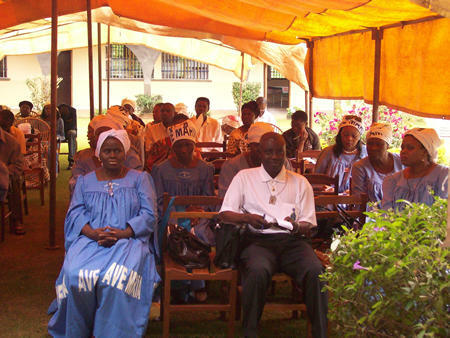 In fact, she said that many Liberian Catholics are facing the problems of literatures to read to uplift their mind. But she learnt that ULRA is ready to help solve this problem. Instantly, she told me to see the Administrator of the St. Teresa's Convent to give us any possible room to run our activities for the Archdiocese. Soon after, I went to the Sisters of Mother Teresa of Calcutta for visit them with some Sacramentals. I met the sister in-charge, Rev. Sister Renette. She took me to AIDS patient’s room both men and women and their children. 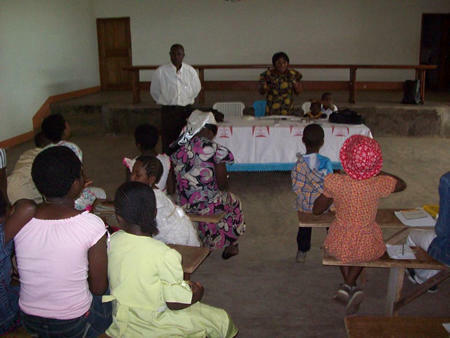 It was very sorrowful to see people suffering from AIDS. The Scapulars, Miraculous Medals, and Dedicated Decades, I took along, sister told me that they are very helpful and consoling. 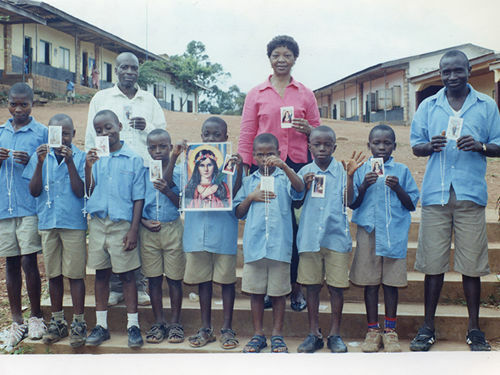 She begged me to send them Catechism book when I return to Cameroon. She said that they need it very much to use in Schools where they teach. More so, I went to see Rev. Fr. Larry [an American] at the Holy Innocent Parish. 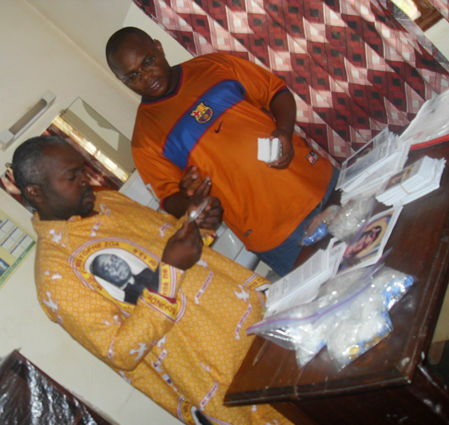 Fr., was very excited to see me with ULRA materials. He told me that he use to do the Apostolate but now he is alone in the Parish, made him for the past 2 years now not very active. Not withstanding, my coming means that Our Lady wants him back to the Apostolate, he told me. 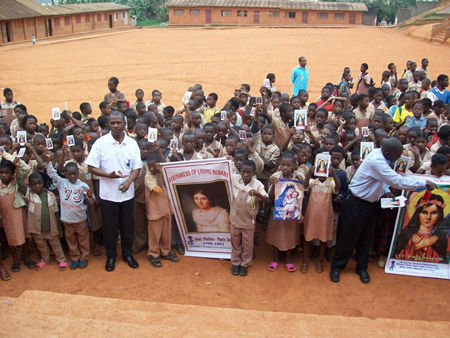 Tomorrow, I shall be at St. Mary's Parish to talk about the Dedicated Decade and Fatima Message. 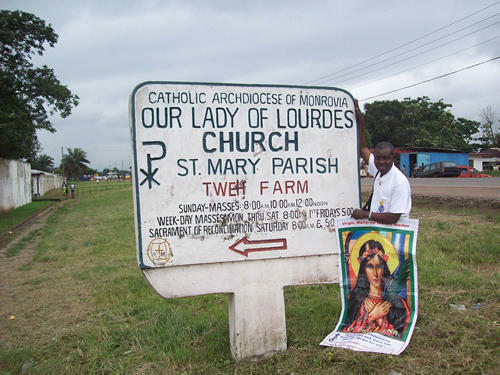 That Parish will be my last stop in Monrovia -Liberia. The announcement has gone ahead. So, I expect huge parishioners for enrollment. This evening I enrolled the Ambassador of Cameroon to Liberia and his wife. 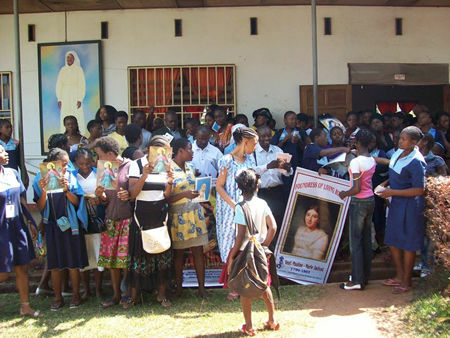 They were at the Convent where I gave them some materials including some books and Dedicated Decades magazines. Please, I shall send more report Monday, after my visit to St. Mary's Parish tomorrow. The photos are followed according to this report. This morning I met the Apostolic Administrator, Rev. Msgr. Andrew Karnley to inform and thank him for his generously. 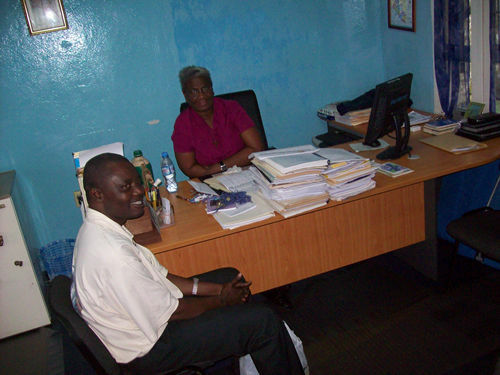 From my discussion with him I understand that it is better for us to look for an Apartment for our Bureau in Liberia. Meanwhile, I have as our coordinator, James W. Doe. He has been with me from the day of my arrival up to now. Again, the Administrator approved his leadership. I will send you James's full address before I depart. 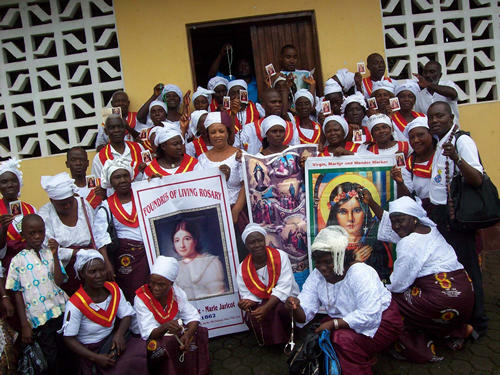 More so, the officers and members of the Legion of Mary told me that they will all give him their support; hence the Universal Living Rosary Association of Saint Philomena (ULRA) is part of their work. I would like to put everything in place before returning back on Tuesday, September 1st. I will be sending all the many lists I have on Monday. 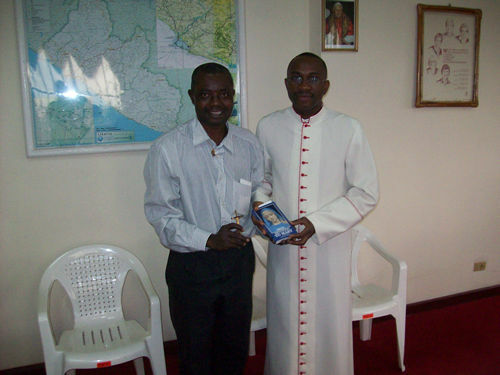 I enclose with some photos I had with the Msgr. Karnley and the Radio Veritas building where I was interviewed previously (see below). 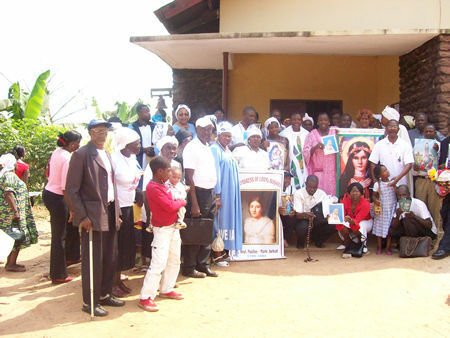 St. Mary's Parish was the last leg of my trip to Liberia. 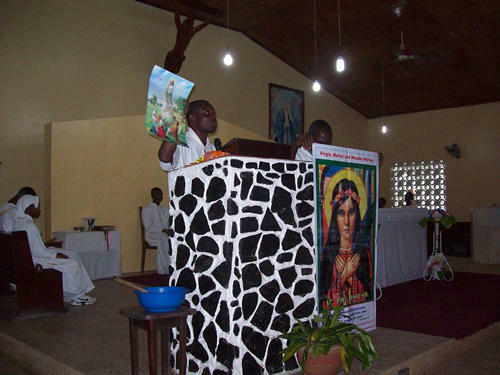 I spoke at all 2 Masses yesterday which started at 8 a.m. After my talk during the Mass, Rev. Fr. 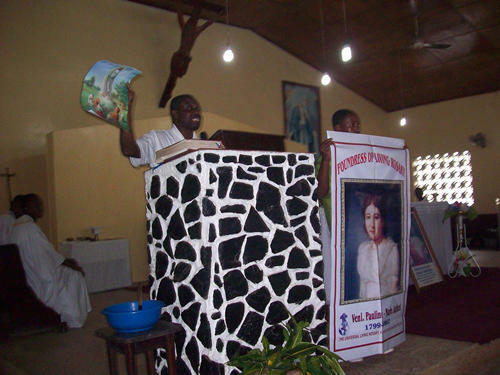 Francis Johnson, from Ghana, showed his appreciation by telling the congregation that "my talk is to be used as the Parish Retreat for this Year, 2009". 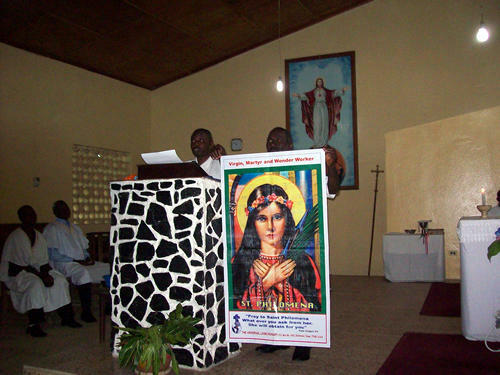 He allowed me about 30 minutes at each Mass to present the ULRA mission in Liberia. Enrollment followed. Many people were enrolled. 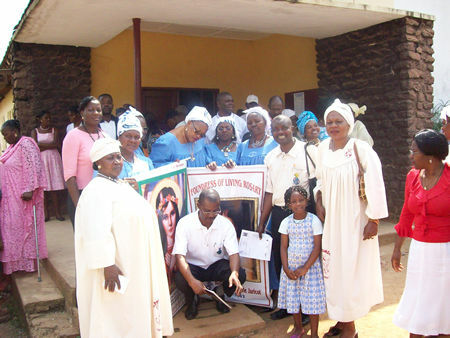 The attached photos (see below) show my activities in the Parish. Some Parishioners continued visiting me this Morning at APC for more enlightenment. 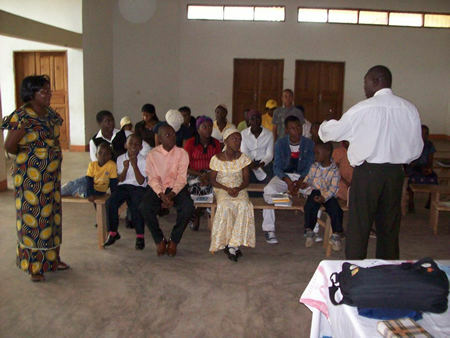 I shall return back tomorrow Morning to Cameroon. I shall give general report on the mission. About 1,000 names are on its way to you. 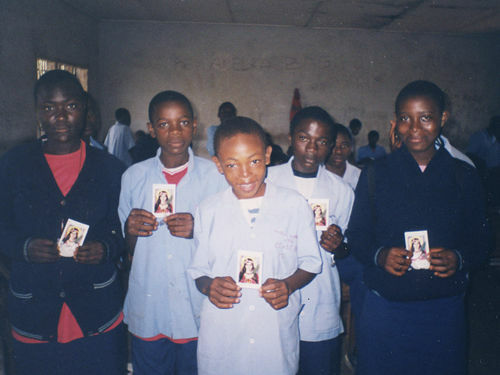 I'm glad to send you some photos of group of Young Legionaries I spoke today on the Importance of the Mass. 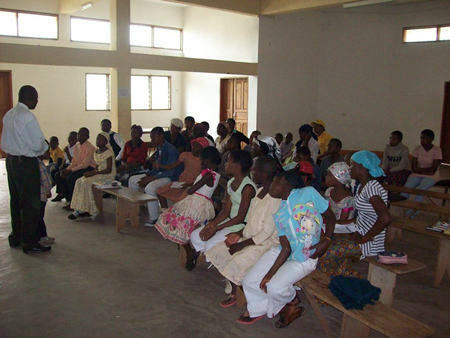 Most of the children are enrolled members. 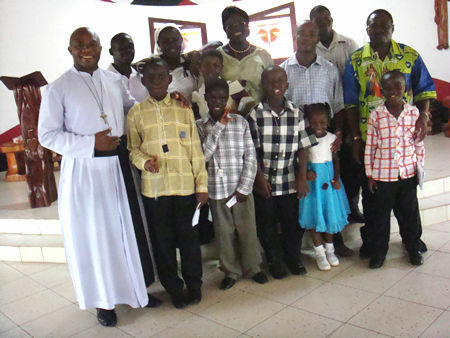 The photos were taken at the Presbytery. Also, one of our members blessed their marriage today in our Parish of St. Joseph. 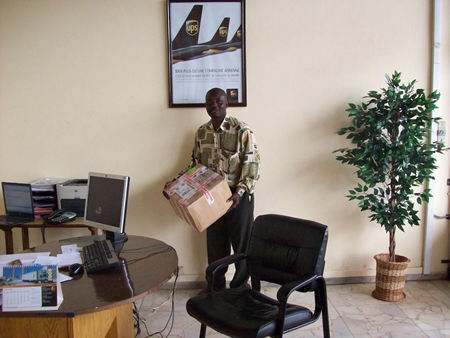 Again, photo of the last box I collected at the UPS last 2 Weeks. 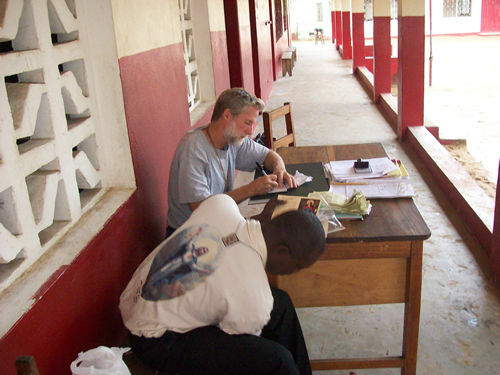 I shall send lists before my possible departure to Liberia Thursday Morning. Greetings from all of us here! A few hours ago, I went and collected 2 boxes from the UPS. 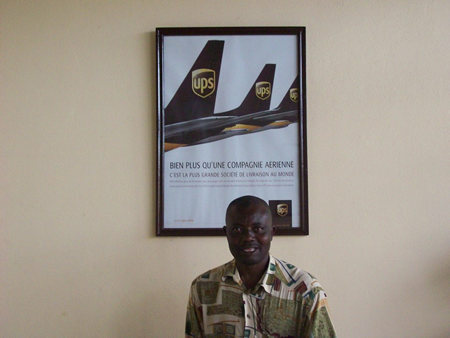 The director of customs here at the UPS office is now a practicing Catholic, thanks to St. Philomena, he told me. Remember that I told you that he blessed his marriage some Months ago. Now, the family is more prayerful than ever. 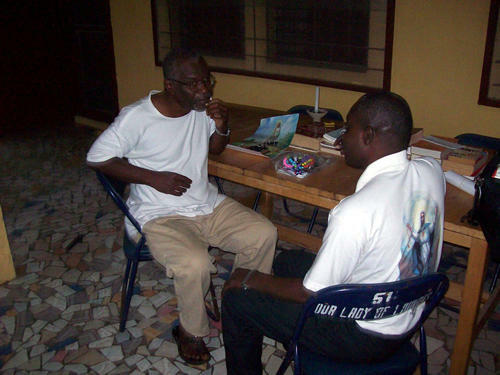 He told me this afternoon, that the favors he received from God since he began using our prayer books and other material is endless. Again, he said that soon after his marriage, he was nominated by his ¨Parish Priest a Catechist. 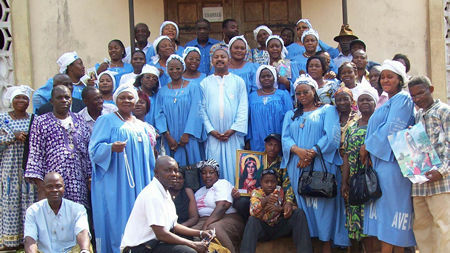 His Parish is St. Mark, Biyem Assi, Yaounde, Cameroon. Meanwhile, I sent today 17 lists of 30 names including 15 other names. Also, a copy of a reply to a letter you sent to our office. 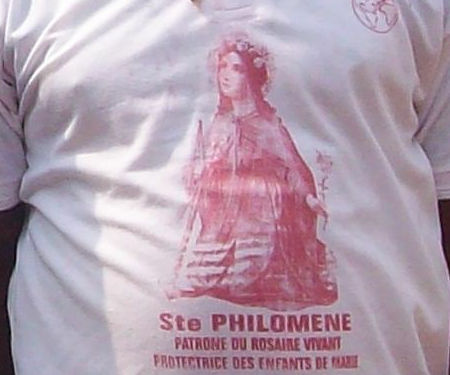 Mom, we are really praying that St. Philomena assist us in all our needs. 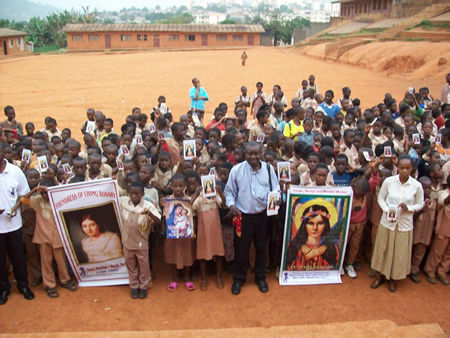 The prayer will continue, since official Novena in honor of St. Philomena's Feast Day begins on July 31. For me, I make sure I rise up every 3:00 a.m. to say my prayers asking God to assist our Headquarters in all its many needs. Wishing you sound health and wisdom. Greetings from all of us here. 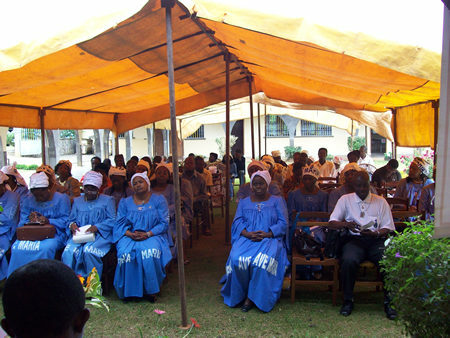 I'm glad to send you some photos of our activities on the co-memo ration of the Feast of Our Lady of Mt. 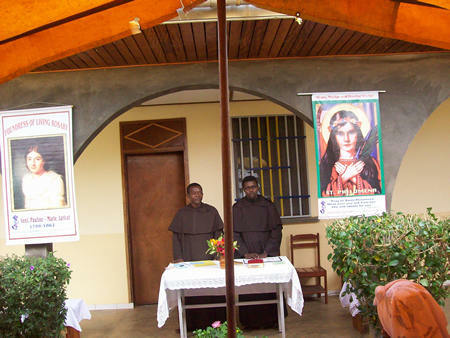 Carmel which took place yesterday Saturday July 18, 2009, since July 16, was a working day, at the Formation Center of the Carmelite Fathers, Yaounde. 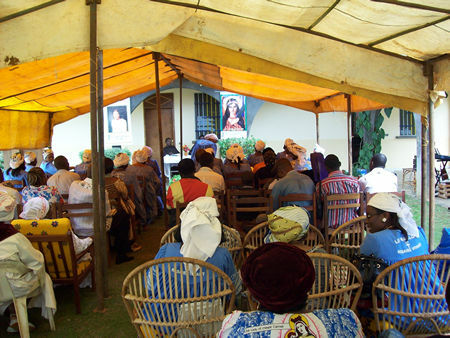 The day which was baptised "The Day of Scapular" started with a short talk delivered by Rev. Brother Jerome, a Carmelite brother. His talk centered on "Church as a family" reminded all present that everyone baptized Christians has a duty to evangelize, everyone according to his own ability and talent. He told members of the Living Rosary that we have a unique role to bring all peoples to Jesus through the recitation of the Holy Rosary. 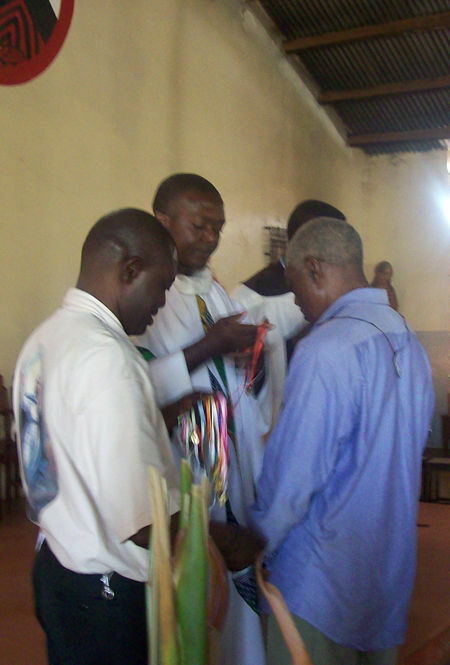 Again, the Living Rosary is an Apostolate in nature; therefore, every member should through the activities of the ULRA. Take an active part in the Church's work of crushing the head of serpent and advising the Reign of Christ. He ended. 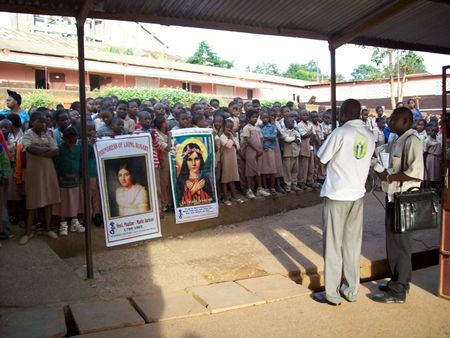 This was followed by the Holy Mass in honor of Our Lady of Mt. Carmel. 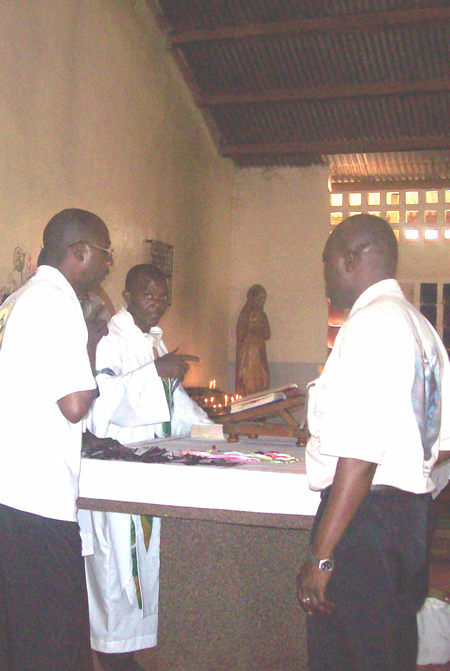 The Mass was celebrated by Rev. Fr. 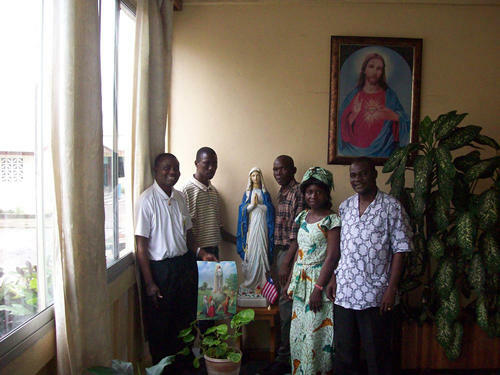 Leger Marie along with 2 other Priests and one deacon together with Carmelite brothers at the formation center. During the Mass, Fr. 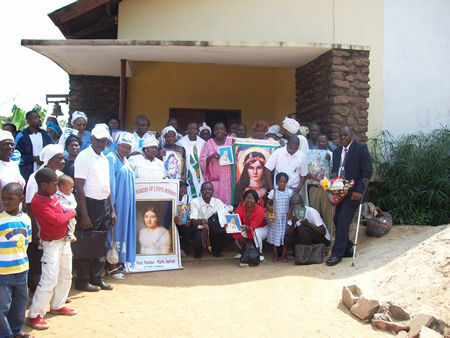 Leger Marie reminded 28 members of the ULRA. Who were to be invested with the Scapular that the Scapular since its origin through St. Simon Stock by Our Lady helps us to confine all our confidence and trust on Our Blessed Mother just as the Carmelites had done since the Apparition of Our Lady of Mt. Carmel in 1251. He went on to say that if we wear the Scapular of Our Lady of Mt. Carmel, we should strive to imitate the virtues of Our Lady herself so as to benefit from the promises of the Scapular. He told us that our late Pope John Paul 11 was wearing his Scapular during an attempt on his life. This part of the miracles of the Scapular he said. In conclusion, he called all members to do all they could to bring Mary to the World by spreading the Living Rosary thereby brings the Reign of Jesus Christ. On the other hand, I collected a box last Monday at UPS. 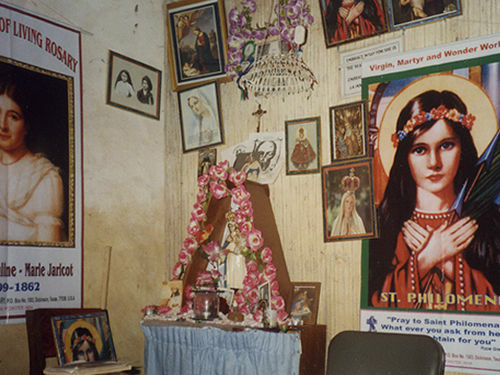 It consists of Crucifixes, latest edition of Dedicated Decades magazines, Oil, Rosaries etc... 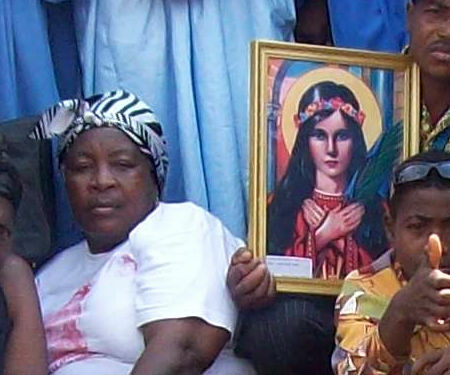 In fact, the Crucifixes will be helpful in our School enrollment crusade this coming School Year, 2009. I wish to thank you so much mom, for including our photos. I will send a copy to the director of the School in which the photos were taken. 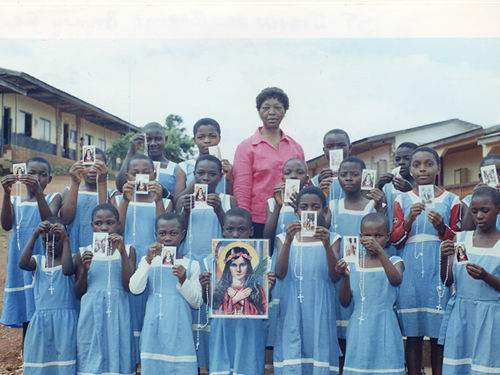 And I tell you they will be delighted and this will create more confidence between us and the Archdiocesan Secretariat of education and even the School management. 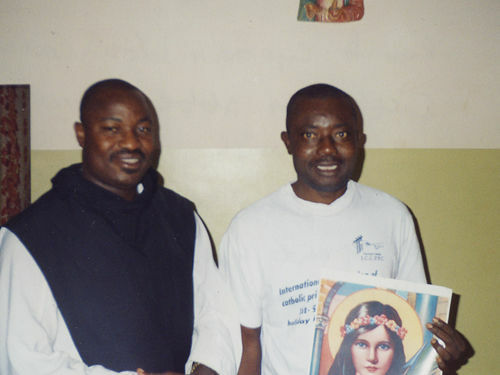 Meanwhile, Dr. Simon Tatah of the University of Yaounde came to our center to tell me that he was promoted, thanks to the intercession of our Princess St. Philomena. He said that the blessings have been much that he does not know how to thank God for so such graces God had bestowed upon him and his family since he joined the ULRA. 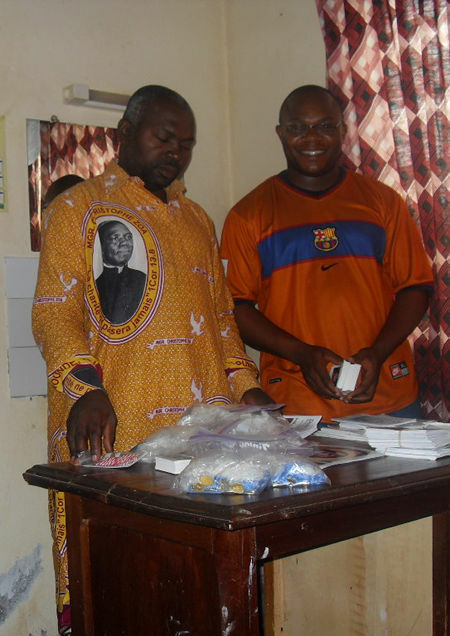 He promised to write to you and to send some lists to us hence he collected some materials. 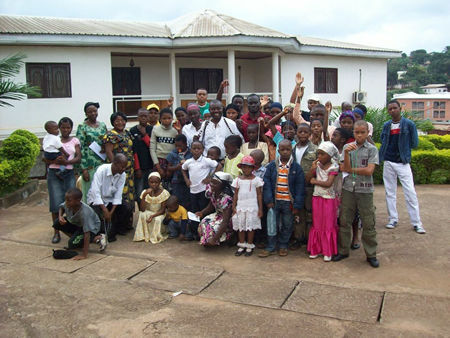 Mom, I hope to leave Yaounde to Mornovia, Liberia on Friday July 24, 2009.There is no direct flight from Yaounde to Mornvia. I'll make a stop-over in Lagos, Nigeria since there is only a direct flight from Lagos to Monrovia. The cost as I told you still stands at $1,500:00.I pray to Our Lady and her daughter, St.Philomena to provide us with the financial means. Rev. Sr. Mary Laurene told me that the whole population is waiting. Rev. 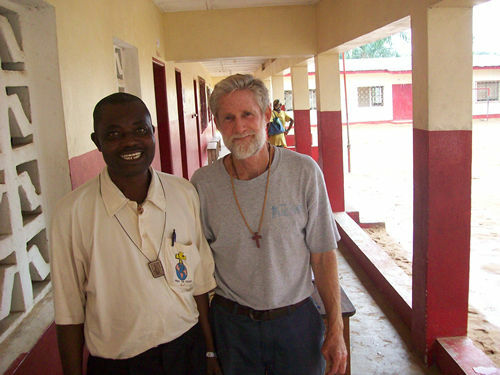 Sr. Mary Laurene shall leave Liberia to the States on Sunday July 26, 2009.I told her to visit our Headquarter in Texas. 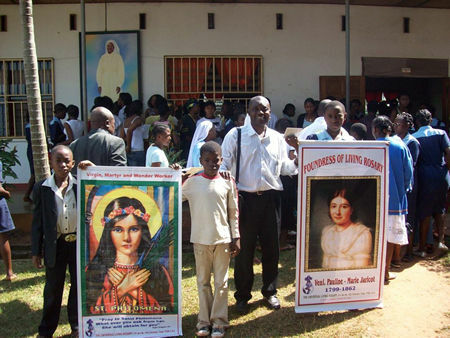 I'm attaching more photos on our activities yesterday on the Feast of Our Lady of Mt. Carmel which took place July 16th. I received 2 boxes via UPS. And small box via the post. 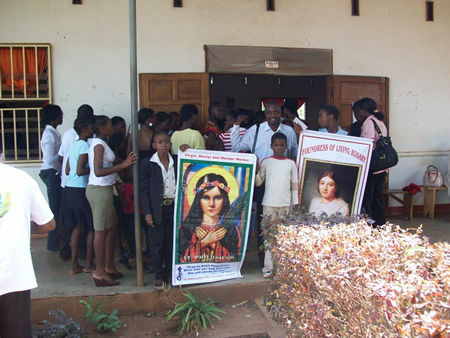 One with Chasubles, Stoles and Chalice including Rosaries, Saint Philomena Oil and cord, brochure, Medals and posters. Thanks for sending the boxes. Enrollment started in the school I told you. I have got some lists with me to send but I will have to wait until I might have completed the school enrollment so as to send more lists. 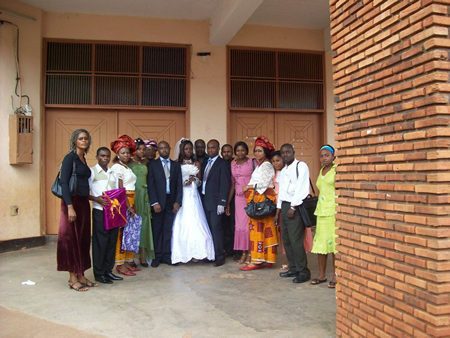 Again, our promoter in Bata in Guinea Equatorial told me that he already sent some lists in three different occasions. And that he will be traveling to Malabo for some Apostolate. Hope that is true. If so I'm very delighted. 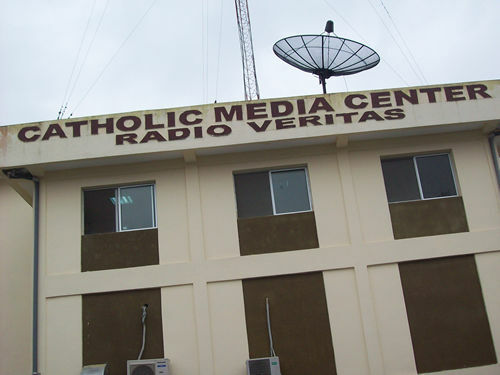 Also, I went to collect the reply to the report I submitted at the Archdiocesan Secretariat of Education, I was told to come back on Friday because they are making their reply in both English and French language respectively. I'm will likely send a copy along with the lists. 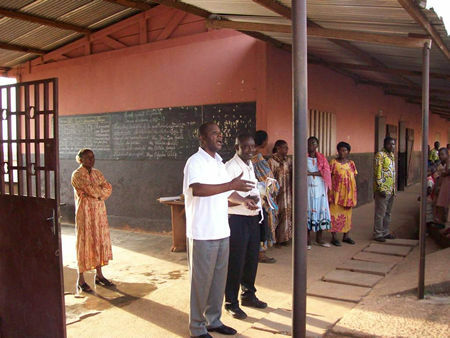 But from look of things, the Church wants us to go ahead with the school project. 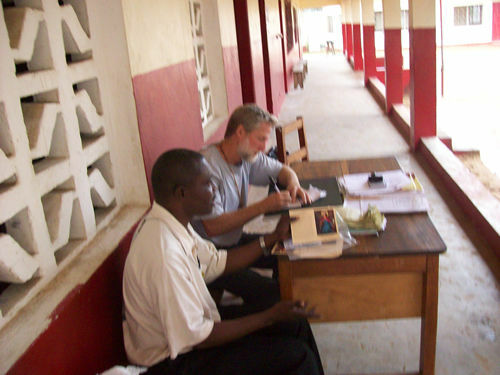 This is because the Secretary General asks me to show him a simple of the enrollment form. He appreciated the simplicity of the devotion. Furthermore, for the fact that we give Crucifix sometime to be placed in some of the class-rooms where there is none is something he admires so much. 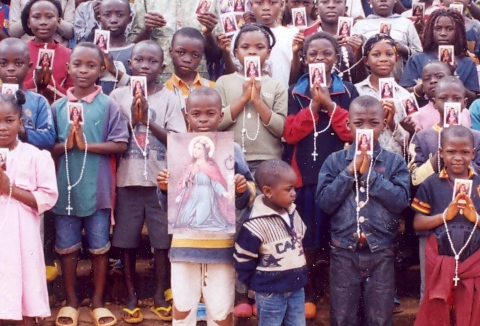 Added to the above, the Carmelite fathers shall begin training for some members who wish to wear the Scapular on May 2nd through July, 2009, in my Parish. Those who completed the training section shall officially be invested with the Scapular on Saturday July 18, 2009, to mark the Feast of Our Lady of Mt. Carmel. I will send you detail of the program when time comes. Thanks a million for your letter of December 22,2008 which I received last month. Thanks a lot too, for the scripts calendar and Sacramentals. 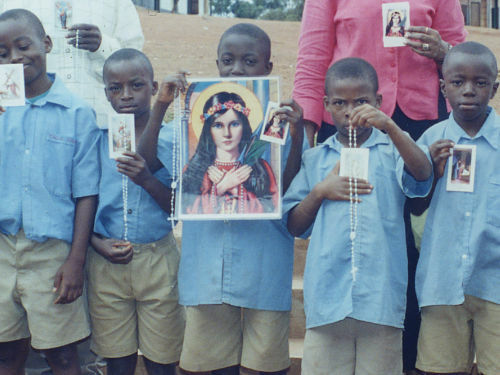 I am most grateful for enrolling me into the Universal Living Rosary Association. My number is 11721. And my Decade is the CRUCIFIXION. I started my decade prayer on the day assigned -19.03.09. Since then, I have been saying my decade everyday for the assigned intentions included. 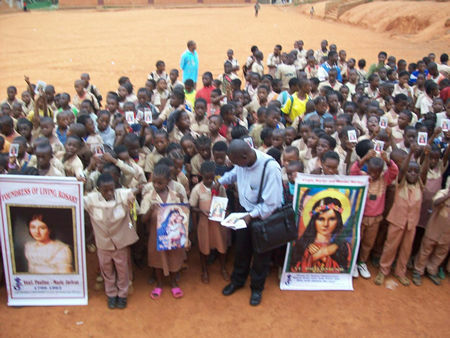 In order to get more members for the Universal Living Rosary Association of Saint Philomena (ULRA), I made many copies of the leaflets carrying information about ULRA and GARMENT OF GRACE, and I shared them to many of my friends, family members and colleagues in and out of Cameroon. I want many people to know about and join the ULRA. 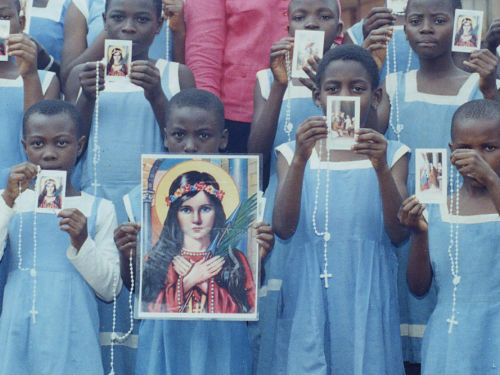 Please, I like you to do me a favor of sending me the biographies of St Philomena and Pauline Jaricot. It is very necessary to know about them so that I will be more explicit to all those who are interested. My address has changed. 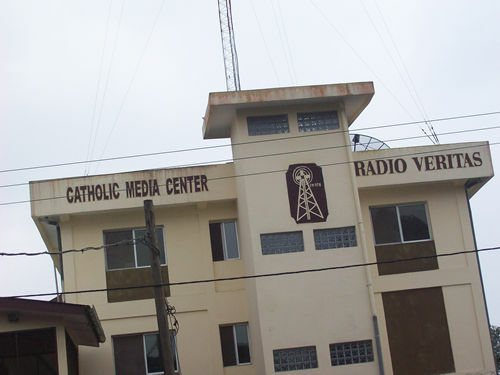 I now work in Douala, instead of Buea. 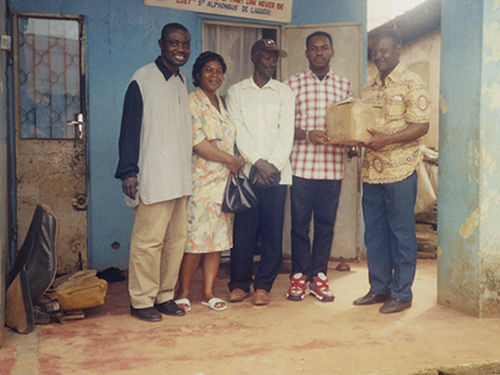 I wish to inform you that I encouraged one of our promoters, Lilian Shuka to go to Bamenda Central prison and begin enrollment there last year. 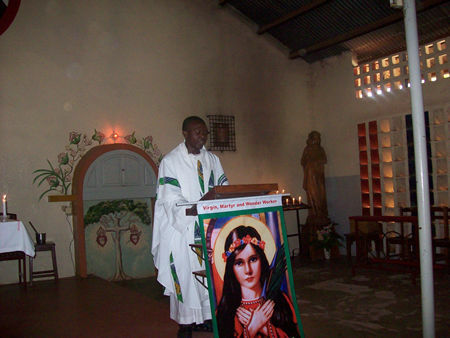 She accepted and today Living Rosary is operating in the Bamenda prison. Today she sent 330 names enrolled. On that note I will be sending her a box just after Easter Sunday. 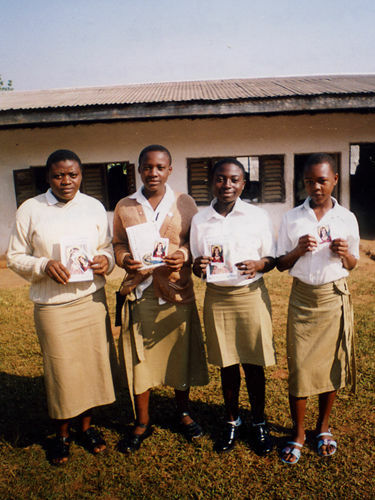 Also, I told her to take pictures and the impression of the prisoners and the prison officials for onward publications. 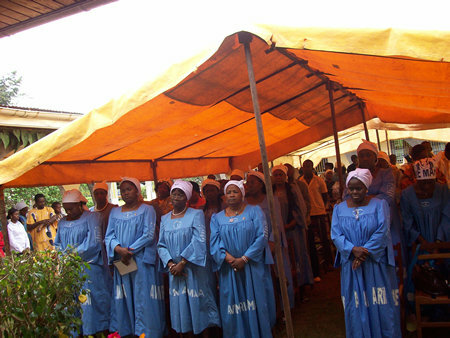 Back here in Yaounde, the Catholic Prison Commission has also affiliated the Living Rosary as one of its members. That is to say that I can attend any conference or seminar that the Commission may organize. Wishing you and all our staff a very happy Easter in advance. 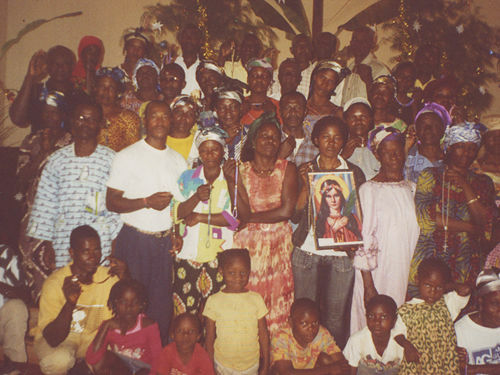 The Dedicated Decade for this Spring is so good in its title"Fatima Our Promise and Hope". I gave some to the enrolled members of my Parish yesterday including our three Priests. They so much appreciate them. It is rich in information and inspiration. 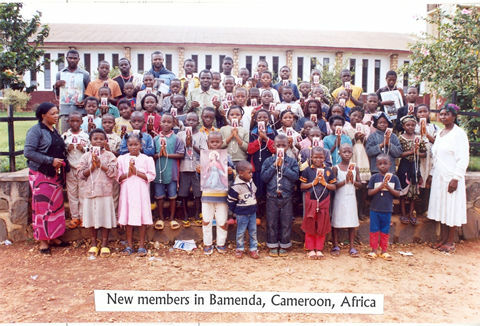 What make it more exciting is the information and pictures from Cameroon. I hope some people will write to you. Please, do remind them to visit our center. Wishing you and all our staff all the best during the Holy Week and happy Easter in advance. I'm happy to send you some photos as promised. These were the product of the school project that I wrote you about. Hope you received the report I sent already. The lists are on its way to you, mom. 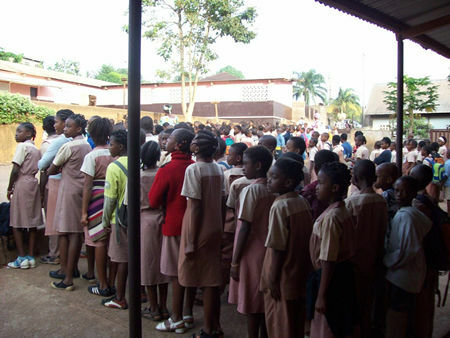 More school enrollment has started. My Parish Priest published information about the Living Rosary on our Parish bulletin at the first Sunday of Lent. I will see him again for another publication. I told the directors of those schools to be patient for the Crucifixes. They really needed them. I sincerely apologize for have not been able to communicate before now. Hope you will forgive me. I have just completed 2 sections of one school and lists of 1,665 names went off this morning. Hope it arrives safe. Many post office stamps on it. I will send photos via e-mail. 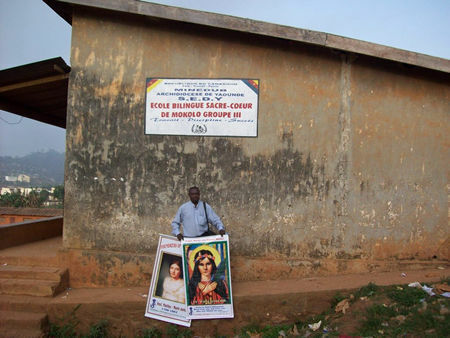 The problem of crucifixes is in almost all the class-rooms. I counted about 100 class-rooms without a Crucifix including some director’s offices. Also, enrollment in other sections of the school will begin this coming week. Meanwhile, yesterday, Re. Fr. Cornelius visited our center. 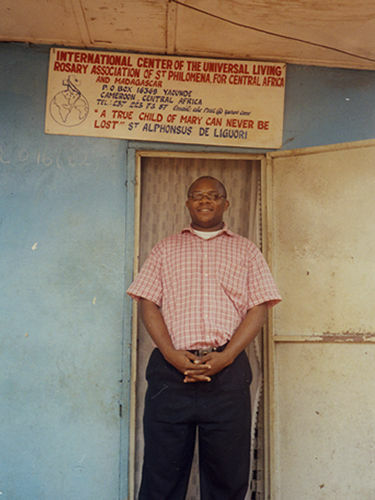 He came for the event of Pope's visit to Cameroon and since he heard about our Center in Yaounde, he said it was a great opportunity for him visiting our center for the first time. 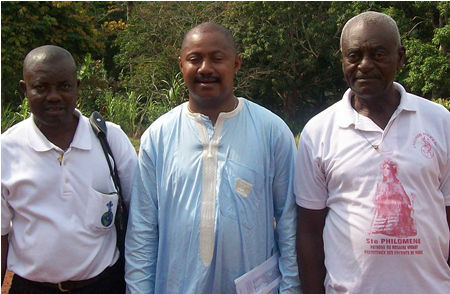 He is a Parish Priest of one Parish in a jungle village in the South West Region of Cameroon. 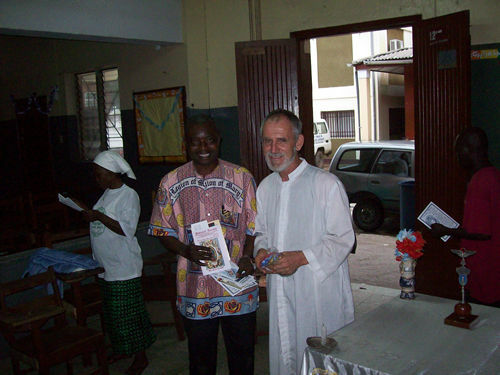 I gave him enrolment lists and items including Stations of the Cross pictures to frame and place in his Parish. He went also with Oil and cord and some important brochures. More so, some members who had come for the visit of our Holy Father and for the Pontifical Mass at the National Stadium tomorrow had been calling and visiting our center. 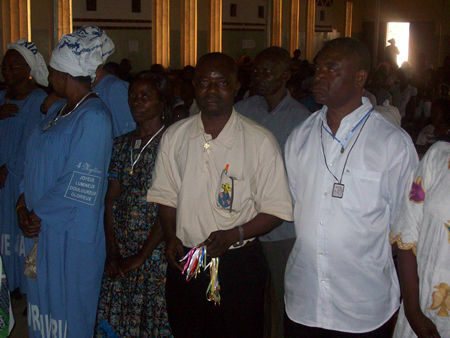 For such members, it is double opportunity attending Pope's Mass and discovering our center. 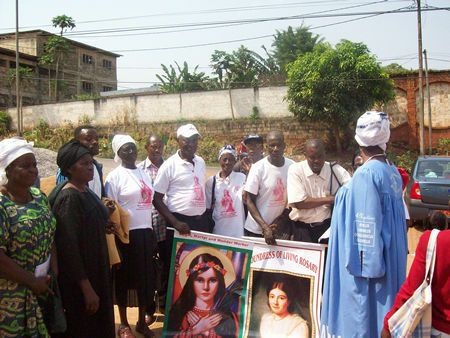 Our Holy Father came since yesterday at 4:00 p.m., Yaounde time. 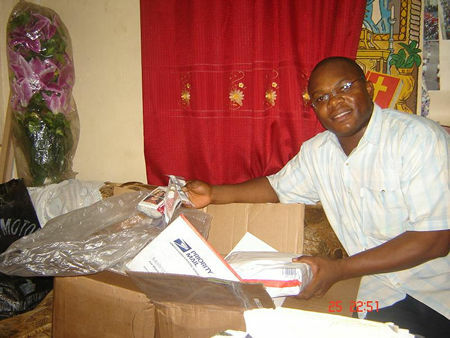 He will leave for Angola on March 20, 2009, at 9:00 a.m. Yaounde time. Let's all pray for his safe trip to Africa and that his trip to increase the faith of our Christians. And that Our Lady Queen of the Apostles to accompany him throughout the journey. Greetings. Thank you immensely for the last box arrived with all the wonderful contains we are indeed grateful and very much to you. I hope please God that Lisa is responding to treatment, she is my prayers. 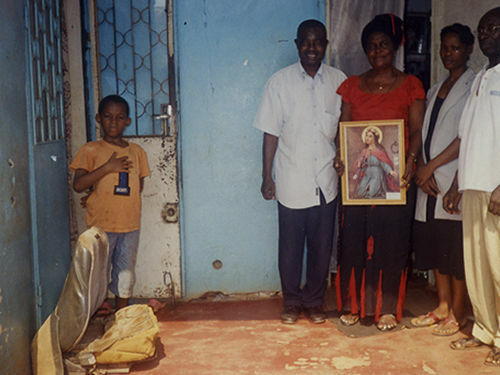 What about Sr. Emerentia? Hope her situation has improved. 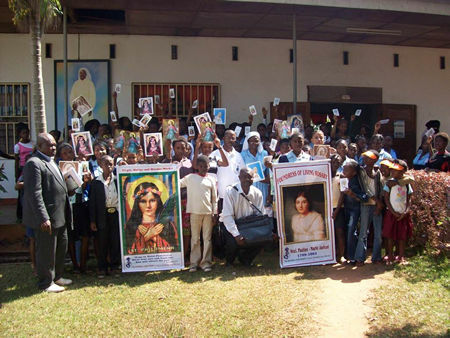 I just posted a letter to you two days ago with lists of 630 Universal Living Rosary Association of Saint Philomena members’ names for registration by airmail; it will take some time before it gets to you. It’s now that I am actually seeing the fruit of our Universal Living Rosary Association of Saint Philomena (ULRA) apostolate in the seminaries. 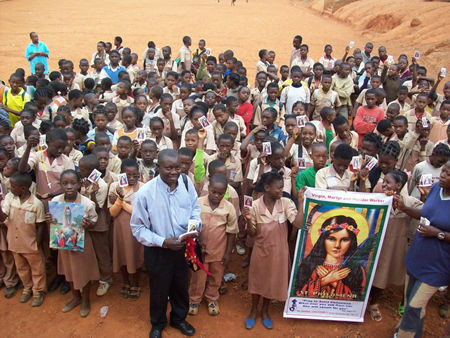 As Claretian missionaries, we have the possibilities of working any where in the world. Now this is Francis in Spain to begin a nice work there. I am sure you must have gotten his address. Fr. Innocent and Fr. Patrick are there in East Africa, We are here now in central Africa and soon we will get more people to work in Congo and other countries. 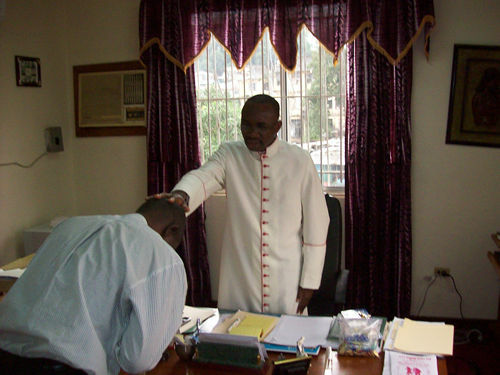 Most of us got to know the ULRA in our seminary days in the Claretian Seminary in Nigeria. In all these, I can only say thanks be to God. We will try our best to get future priests and missionaries involved in it. In such a way that it spreads naturally all round the world. Our interest is always on the decade. Mrs. Patti, LET US GET THE WHOLE WORLD ENTANGLED IN THIS CHAIN OF DECADES THROUGH WHICH OUR BLESSED MOTHER AND OUR PATRONNESS WILL LEAD US TO CHRIST JESUS. I am just so happy today that Francis expressed the desire to handle the Immaculata. It may interest you to know that Francis is not alone. 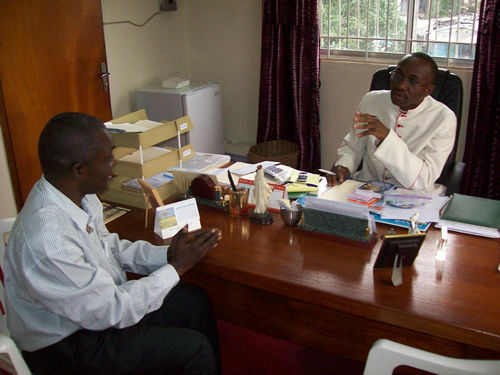 He is there with other promoters I worked with in the Claretian institute of Philosophy: Michael Chima, cmf; Gilles Njobam, cmf. For all these let us say THANKS BE TO GOD.